With our solid industry history, we know what our clients expect from us. We bring you superior products from leading manufacturers and find the right solution to meet your heating and air conditioning needs. Your HVAC system must be efficient, reliant and cost-effective to keep your home comfortable for you and your family. When the heat or AC is out, that comfort level suddenly disappears! At Hart Mechanical, we know you need the right system for your specific needs. We work with you to customize the system for you, not just a cookie cutter standard. We know you need reliability, efficiency and a system that will last for years to come. And, we also know you want a company that will be there to stand behind their products and work. 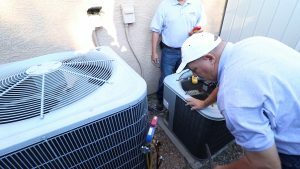 Your air conditioner must work hard during the long hot summers in Phoenix. In order to protect your investment and keep your air conditioning system running correctly, you need to keep it properly maintained. Our HVAC technicians will come to your home and perform a full system diagnostic to determine the exact issue you’re having with your system. Our professional technicians will always discuss any problems detected or any repairs required, providing suggestions and options. Friendly, customer-focused services – it’s not just our motto, it’s what we live by! The outside fan or unit is not running. The condenser fan located outside your home removes heat from the compressor and keeps refrigerant cool. The condenser fan can stop working due to a faulty capacitor, a bad motor bearing can cause it to overheat, or there may not be power to the system. If it does not run or is not spinning at full capacity, it can cause your compressor to fail. Rooms not cooling adequately. This can be due to poor duct design, kinked or damaged air ducts, or an air duct leak. Insufficiently charged air conditioning system. If an air conditioning system is not properly charged with refrigerant, it is unable to efficiently remove heat and cool your home. The air conditioning unit is not blowing cold air. Normally this could be the result of numerous issues which could include; a lack of power to the system; dead thermostat batteries; or a low system charge, just to name a few. Dirty air filters. Dirty air filters can cause a multitude of system malfunctions. All filters should be changed every month. Ductwork is typically made of sheet metal that is insulted after it is installed, and it carries air from one point to another. Improperly sized or designed ductwork is the most common reason people are not comfortable in their own homes. By custom fabricating sheet metal ductwork, we can quickly and efficiently build any necessary parts of the duct to modify and enhance the performance of your system. Even if your entire duct system needs replacement, we can design and fabricated a new system just for your home. Have you noticed hot or cold spots in your home: Does your air conditioner take longer to cool your home than it used to? Are you looking for a new energy-efficient model? Not sure what you need? You can depend on Hart Mechanical to provide you all the information to make an informed decision on the purchase of your new air conditioning unit. If you will be installing an entirely new unit, the layout will be custom designed for your home. Your air conditioner and design will be a perfect match to your cooling needs and to your home’s design. What is the cost to repair vs. replacing your current system? The central air conditioner is either a split-system unit or a package unit. In a split-system central air conditioner, an outdoor metal cabinet contains the condenser and compressor, and an indoor cabinet contains the evaporator. In many split-system air conditioners, this indoor cabinet also contains a furnace or the indoor part of a heat pump. The air conditioner’s evaporator coil is installed in the cabinet or main supply duct of this furnace or heat pump. If your home already has a furnace but no air conditioner, a split-system is the most economical central air conditioner to install. In a packaged unit, the evaporator, condenser, and compressor are all located in one cabinet, which usually is placed on a roof or on a concrete slab next to the house’s foundation. This type of air condition also is used in small commercial buildings. Air supply and return ducts come from indoor through the home’s exterior wall or roof to connect with the packaged air conditioner, which is usually located outdoors. Packaged air conditions often include electric heating coils, a natural gas furnace or the typical “heat pump” cycle. The combination of air conditioner and central heater eliminates the need for a separate furnace indoors. There is also the ductless mini split-system air-conditioners (mini splits) which have numerous potential applications in residential and commercial buildings. The most common applications are in multi-family housing or as retrofit add-ons to houses with “non-ducted” heating systems, such as radiant panels, or space heaters (wood, propane). They can also be a good choice for room additions, small apartments or garages, where extending or installing distribution ductwork (for a central air-conditioner or heating system) is not feasible. Like central systems, mini splits have two main components; an outdoor compressor/condenser, and an indoor air-handling unit. A conduit, which houses the power cable, refrigerant tubing, and a condensate drain, links the outdoor and indoor units. Proper size and installation are critical to air conditioner efficiency. A unit that is too large will not adequately control humidly; conversely, a unit that is too small will not sufficiently cool a home during the summer months. Improper unit location or duct installation, as well as insufficient insulation, may greatly diminish efficiency. It is important to choose an air conditioner with high efficiency. Air conditioners are rated according to their seasonal energy efficiency ratio (SEER), which indicates the relative amount of energy needed to provide a specific cooling output. Many older systems have SEER rating of 10 or less, while today the minimum allowable is 14. If you choose to replace your HVAC system, full installation typically takes six to eight hours; if ductwork replacement is required, the process may take a bit longer. If needed, multiple technicians will be provided to ensure installations is complete within a reasonable timeframe. Ensure there are enough supply registers to deliver cool air throughout the home, as well as a sufficient number of return air registers to carry warm air back to the air conditioner. Install the thermostat away from heat sources, such as window or supply registers. There is no time to waste when your furnace goes out and you need to take the chill off those rare chilly Arizona nights. Unfortunately, a repair is not always going to be possible, the unit is simply just too far gone, and the parts and work may be such that a replacement simply makes more sense. Purchasing a new furnace can be expensive and you will be making a significant investment. Fortunately, our highly trained staff knows exactly what it takes to have a reliable and efficient heating system. We understand that you may not have been planning on spending money on a furnace repair job. We will review all of the options available to you, so you can make a well-informed decision. We offer upfront quotes, we don’t tack on hidden fees or unnecessary charges, and we don’t surprise you with any unexpected total when the work has been finished. Even the most reliable machines brake down. If your furnace stops working, call Hart Mechanical. We will work with you to ensure your home heating system is working properly to keep you comfortable. We will get the job done promptly and affordably! At Hart Mechanical we maintain and repair all makes and models. All repairs are unique, and our trained technicians will quickly determine what exactly is wrong with the unit. We will then provide you that information and thoroughly discuss the steps involved and the cost to get the furnace back up and running. What to expect when you call Hart Mechanical for your next heater repair or installation. Service technicians will arrive at your home in marked trucks wearing a company uniform. Honest and efficient repairs or installations. Heat pumps offer an energy-efficient alternative to furnaces and air conditions for climates with moderate heating and cooling needs. Heat pumps use electricity to move heat from a cool space to a warm space, making the cool space cooler and the warm space warmer. During the heating season, heat pumps move heat from the cool outdoors into your warm house and during the cooling season, heat pumps move heat from your cool house into the warm outdoors. Because they move heat rather than generate heat, heat pumps can provide equivalent space conditioning as little as one-quarter of the cost of operating conventional heating or cooling appliances. For homes without ducts, there is also a mini split heat pump. There are features you can look for in a heat pump. Unlike standard compressors that can only operate at full capacity, low-speed compressors allow heat pumps to operate close to the heating or cooling capacity needed at any moment. This saves large amounts of electrical energy and reduces compressor wear. Some models of heat pumps are equipped with variable-speed or dual-speed motors on their indoor fans (blowers), outdoor fans, or both. The variable-speed controls for these fans attempt to keep the air moving at a comfortable velocity, minimizing cool drafts and maximizing electrical savings. It also minimizes the noise from the blower running at full speed. You can save money on your heating bills by simply resetting your thermostat when you are asleep or away from home. You can do this automatically without sacrificing comfort by installing an automatic setback or programmable thermostat. Using a programmable thermostat, you can adjust the times you turn on the heating or air-conditioning according to a pre-set schedule. Programmable thermostats can store and repeat multiple daily setting that you can manually override without affecting the rest of the daily or weekly program. The location of your thermostat can affect its performance and efficiency. To operate properly, a thermostat must be on an interior wall away from direct sunlight, drafts, doorways, skylights, and window. It should be located where natural room air currents-warm air rising, cool air sinking occurs. Furniture will block natural air movement, so do not place pieces in front of or below your thermostat. Make Hart Mechanical your first and only call when you are looking for great service and response. Whether you have an emergency repair need; selection and replacement of your HVAC system components; annual maintenance – we will your source for the best high-efficiency, cost-effective and reliable HVAC system. Contact us to find out about your financing options today!